Modern is in an interesting place at the moment. There are a bunch of established decks and if you know your deck well you can play any one of them. Currently though the most popular decks on magic online are Dredge and Izzet Phoenix. 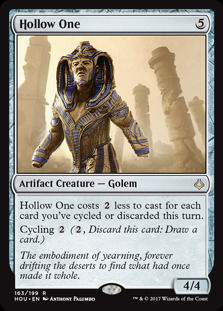 If you continue to look at the meta there are other decks like Grixis Shadow and different versions of Hollow One or Living End lurking around. You can pick up one of those decks learn them and do very well with them. Though I would rather play a deck that beats them. 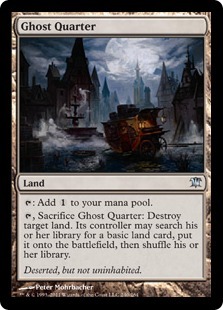 There are many great options to attack the graveyard in Modern but my personal favorite is Rest in Peace . 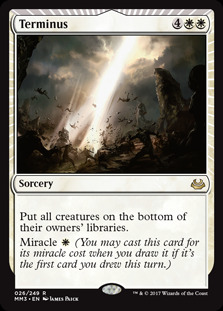 White has some of the best sideboard options in the format and this card is no different. I am going to provide you with a few established lists that play RIP in the board and then some other decks that I have been testing with. This has been the go to control deck for some time now. Jeskai is still fine but cutting out the red for a more consistent and less painful mana base seems to be very alluring to the control players. I played this deck before Teferi, and the hero of Dominaria only makes the deck much better. Having access to a sweeper like Terminus makes an opposing board of recurring graveyard threats much less formidable. I saw others squeeze in a copy of Settle the Wreckage which I am a big fan of. The other removal also keeps creatures out of the graveyard. That alone takes away the power of the graveyard reliant decks. Rest in Peace in the board of this deck is almost not needed but it does give you access to a silver bullet that really solidify your matchup against Phoenix, Dredge, and anything else that relies on the graveyard. Next is a deck that shows up every now and then but seems to be picking up steam. A different spin on the Eldrazi Taxes deck. 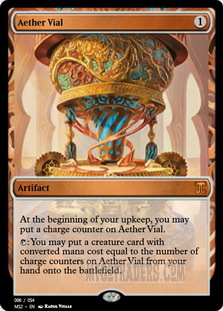 It takes out Aether Vial and replaces it with the ability to cast Chalice of the Void on one. 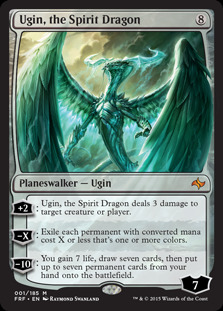 That alone can shut down the Phoenix deck and hinder a lot of other decks in the format. Because of its ability to cast a quick Chalice, the deck is built with no one drops. Normally that would be a bad thing but not in this deck. 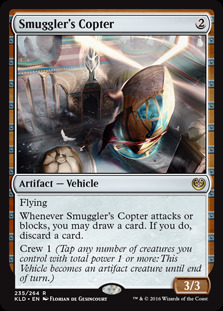 I actually like the addition of Smuggler's Copter as it can be a way to dig and find what you need to win a game. This deck also has a great mainboard plan against Tron. 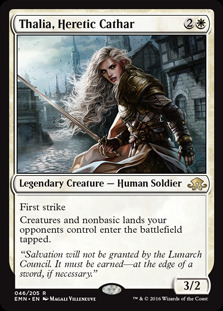 The Leonin Arbiter and Ghost Quarter plan is always fun and it also has Thalia, Heretic Cathar to make those lands come into play tapped. 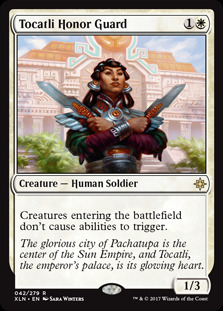 Thalia also shines against Dredge and Phoenix making their creatures come into play tapped and making them less effective. 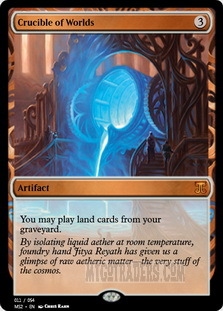 I also love the sideboard of this deck. Once again it has access to Rest In Peace but also much more. 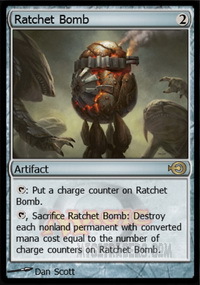 I like the addition of Worship and Ratchet Bomb . 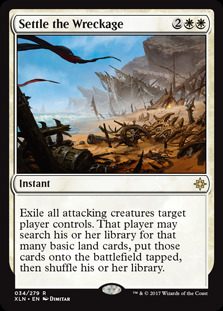 If you need a sweeper, Settle the Wreckage cleans up the opposing board nicely. 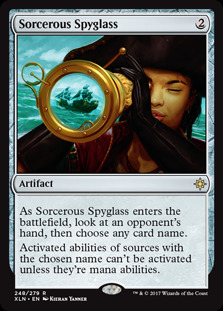 Then it has two more Standard all-stars in Tocatli Honor Guard and Sorcerous Spyglass . This might be a deck that I would like to pilot. It is something to work towards at least. Next up is an old list that I enjoyed playing awhile back. It may be in a good position now. Both Dredge and Izzet Phoenix kill you by dealing damage. 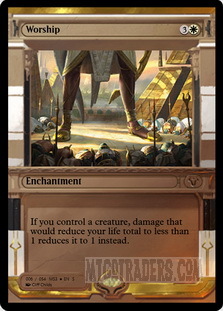 Last I checked, mass amounts of life gain was a good strategy against creature decks. 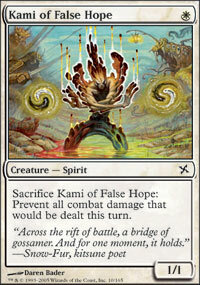 Not only can you gain a ton of life but you can create an infinite fog effect with Kami of False Hope . 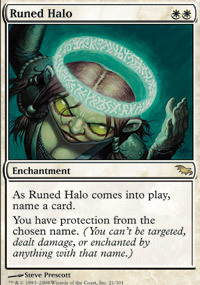 Runed Halo naming Arclight Phoenix also seems like a good plan. This deck also packs plenty of removal with Hallowed Burial being a way to remove the threats without putting them in the graveyard. It might be better to place a Settle the Wreckage in the main but I will have to test it to know for sure. This deck may be ok without it. The whole purpose is to survive until the late game so you can out last your opponent. If you are able to chain Kami or even Martyr of Sands then I do not see any deck that wins by damage having a chance to succeed. The challenge would be to get there. The other benefit of this deck is how good it can be against Tron. It has a good land destruction package and Crucible of Worlds to keep bringing the pain. The sideboard gives you access to Damping Sphere and some Planeswalkers to help sure up the matchup. 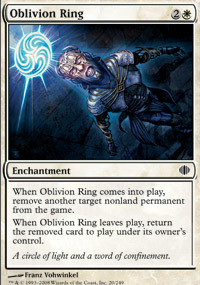 I have been thinking of adding something like Oblivion Ring though to answer Ugin, the Spirit Dragon or Karn Liberated . This deck could work against the current meta if it is tested and built properly. I did not give up on my pet project and have another updated build. The biggest struggle with this deck is picking the right creatures and the figuring out the mana base. I mess it with it all the time and I can never seem to settle on what I want. It will take a ton more testing but my time is limited. This may be a project that I have for quite a while. If you have any thoughts let me know? I would love to hear your input. If you aren’t playing Rest In Peace how are you handling these graveyard decks? Let me know in the comments.